French bistro fare and some American standards, too, in an old-fashioned setting. Dinner Thurs.-Sat. 6:00 p.m.-2:00 a.m., Sat. Brunch 11:00 a.m.-4:00 p.m., Sun. Brunch 11:00 a.m.-6:00 p.m.
: Bagatelle is part of The ONE Group that owns STK restaurants, so look for the entrance of the steakhouse to find your way to this sibling. Given its name, you should understand that you will encounter a French, old-fashioned atmosphere that is created via a white décor with quite a feminine touch and bistro chairs. Since both restaurants share the same executive chef, Robert Liberato, some dishes have an American mark, like the yellowfin tuna tartare, the jumbo lump crab cake, the grilled wild salmon with a horseradish crust, a black truffle flatbread and Le Burger. Other than that, you will find a frisée aux lardons; mussels in a Dijon broth; coquillettes, which are elbow pasta, with French ham and Emmental cheese in a truffle jus; and, of course, a steak frites, prepared with a pepper crust. And if you like meat, the beef tartare, hand-cut filet mignon, quail egg, capers, crispy shallots and a petites herbs salad, is a must-have. You can opt for “fromage” before the desserts, which actually need a little work to be more flavorful (the evening we went we had a coconut genoise and a red berries cobbler). A prix-fixe menu for $35 is a good value for this bistro-like food. The brunch served on the weekend is very popular; make sure to have a reservation. 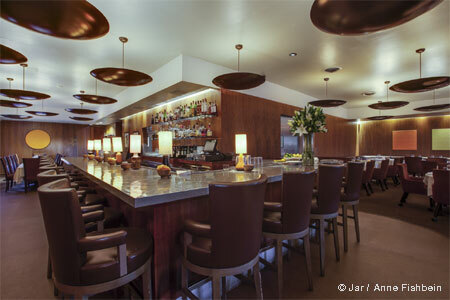 There is a small wine list, so since the bar occupies a large part of the space, enjoy one of the specialty cocktails. 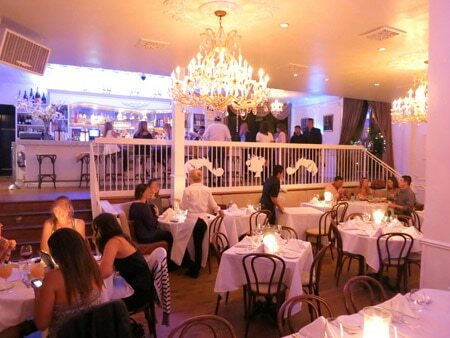 In addition to this West Hollywood location, there are Bistrot Bagatelle branches in New York, São Paulo, Saint Barthélemy and Saint-Tropez.